Accessory Genie - Consumer Electronics and Accessories Industry News: No school + visiting friends = A SUMMER PARTY!!! Summer is the best part of the year! Who can dispute that fact? The sun is shining, most people are out of school (less those over-achievers who do summer school), parents are taking vacation and family/friends are coming out for a visit. How can one ever complain?! Like all summers, I make a plan to take a mini road trip, relax by the lake and see all the blockbusters! But I have decided to do something a bit different this time around: I'm going to throw a party! "Why throw a party?" you ask. The answer is quite simple - my sister is leaving her new house unattended for 10 days as she goes on holiday. The house is lonely and needs attention! As always, I'm taking one for the team! The best part is that my sister is leaving around the 4th of July and I'm going to have friends visiting at the same time. What better way to show them (and the house) some love than with a party?! And to have a really good party you need a good speaker! Enter the GOgroove BlueSYNC MCX! Unlike your other portable speakers, this one is Bluetooth. This means that my friends with an iPhone, Samsung Galaxy S4, iPod and Google Nexus can take turns playing their music off of this speaker. It can remember up to 8 devices at once AND can stream music up to 30 feet away! Have no fear: for those with non-bluetooth devices, there is still a 3.5mm audio cable and AUX-in port. 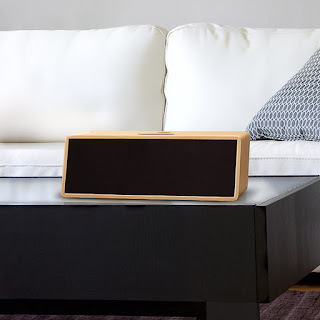 The MCX is housed inside a wood casing making it look more like a household decorative piece than a speaker. There are on-board controls that allow you to adjust the volume, power on/off, pause/play/ and pair your device. The acoustic chamber resonates to provide strong, crisp audio no matter where you are! The best part: the GOgroove BlueSYNC MCX is on sale for 60% off this week. It looks like I'm all set, right? I have the location, the people and the speaker. I feel like I have all the answers. I just hope nothing gets broken. If that happens, I really won't have an answer for that! Wear your sunscreen and enjoy the weather!! !